The main political party in the Pakistani city of Karachi, the MQM, has closed its offices in protest over a fatal bomb explosion on Tuesday night. City businesses and offices have also shut following the blast, which killed five people and wounded several others. The violence coincided with bombings in the south-western city of Quetta in which eight people lost their lives and nearly 60 were wounded. 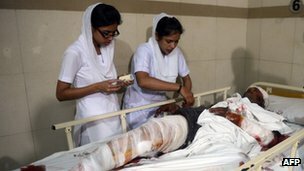 Pakistan has seen a wave of violence ahead of general elections on 11 May. In a separate development, a court refused bail for former military ruler Pervez Musharraf in a case related to the assassination of former prime minister Benazir Bhutto in 2007. The ruling is the latest setback for Mr Musharraf, who returned to make a political comeback in March after four years in self-imposed exile. He is currently under house arrest facing possible treason charges in another case relating to his imposition of emergency rule in 2007. He was disqualified from standing as a candidate in the elections and now faces a host of court cases. Tuesday night's attack on the MQM - or Muttahida Qaumi Movement - is the latest against secular parties in the run-up to landmark elections, which should mark the first civilian-to-civilian transfer of power in Pakistan's short history. The MQM is based in Sindh province, with a membership mostly comprising the descendants of Urdu-speaking migrants to Pakistan at the time of the partition of British India in 1947. The BBC's Shahzeb Jillani in Islamabad says that security fears faced by the MQM and other relatively liberal parties including President Zardari's Pakistan People's Party (PPP) and the Awami National Party (ANP) are overshadowing the run-up to the vote. In the last two weeks, at least 30 people have been killed in some 20 incidents of electoral violence, Pakistan's Free and Fair Election Network says. The Taliban have been blamed for targeting and killing candidates of parties who openly oppose them. The threat has become so severe that many prospective MPs say that it is impossible to campaign openly. The PPP has decided to keep its young chairman, Bilawal Bhutto Zardari, away from the campaign trail for security reasons. In a video message on Tuesday, Mr Bhutto Zardari told his supporters that he wanted to lead the campaign, but that his party was at war with a militant mindset which was opposed to peace and prosperity. The security fears confronting the three parties are in sharp contrast to the huge rallies being held by their rivals who are seen as soft on the Taliban, our correspondent says. These include former Prime Minister Nawaz Sharif, former cricket star Imran Khan, who heads the Tehreek-e-Insaf, and the leaders of Islamist parties.